At least once per decade a new receiver design comes along which breaks the mold of conventionality and causes a flurry of discussion among radio hobbyists. Such was the case with the Drake R-7/R-7A of the late 1970s, the ICOM R-70 in the early 1980s, and the Watkins-Johnson HF-1000 at the beginning of the 1990s. A case could be made for other receivers, but these three caused a stir in the areas of performance, features, and price point. In 1996 the British have come up with their own notable-- and controversial-- communications receiver. How well does it perform for the mediumwave and tropical bands DXer? This article will present an overview of performance and features, and provide a "hands-on" report. Talented designer John Thorpe is the individual responsible for the AOR AR7030. He became known to hobbyists as the man behind the "HF" series of receivers for the UK's Lowe Electronics, including the highly-regarded HF-225 Europa. Many had expected Lowe Electronics to continue the progression, but the HF-350 was never produced (remember the mysterious "Project N"?). Thorpe and Lowe Electronics parted ways in a not-so-amiable fashion, with Lowe going on to produce the traditional--and "comfortable"--HF-250. Thorpe took the road less traveled by joining forces as an independent designer with the AOR Corp. and creating the unconventional AR7030. This receiver is manufactured at AOR's new UK facility in Belper, Derbyshire. Well-balanced performance, sturdy construction, and minimalist controls are qualities that have marked John Thorpe's previous receiver designs. These characteristics are present in the AR7030 as well but there are unusual features sprinkled liberally throughout. Among these are auto-tuning synchronous detection, onboard filter calibration and measurement, automatic RF attenuation for extremely strong signals, and a comprehensive alphanumeric display of virtually all receiver parameters. Despite the automatic features available, the AR7030 is highly flexible. The operator can disable them if desired and be in full manual control. An infrared remote is supplied with the receiver, providing control over all commonly used functions. I cannot remember another radio that generated so much positive and negative discussion at its introduction as the AR7030. Therefore a few comments are in order about the controversy surrounding the new AR7030. The internet newsgroup rec.radio.shortwave and Compuserve's SWL section in the Hamnet Forum have had many postings from both sides of the fence. 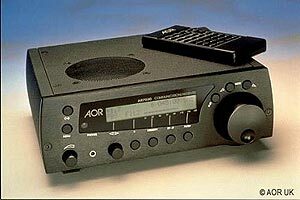 AOR introduced the AR7030 at the Leicester hamfair/electronics show in October 1995, billing it as a "high dynamic range" receiver. The detailed information and specifications reported by AOR caused many to wonder if such commercial/military performance could really be reached by a consumer-grade receiver. When a price was announced by UK retailer Javiation, they wondered even more: £799 within the UK, or £695 to the USA including FedEx shipping. For British customers the AR7030 is less than half the price of a NRD-535. AOR missed their initial Christmas 1995 release date by months, due to printed circuit board problems at a supplier. There were even (unfounded) rumors of legal action by Lowe Electronics against AOR. Although eight receivers were available on loan to reviewers in January, regular production did not begin in earnest until April. This delay encouraged skepticism even more. The unusual design, small size and new features of the AR7030 also raised the eyebrows of those who prefer more traditional receivers. However, a lively debate over statements in a Radio Netherlands' Media Network review (and a more detailed technical explanation on Radio Netherlands' internet WWW home page) is what really fueled the controversy. The review presented test results with significantly poorer intermodulation-free dynamic range (IFDR) and 3rd order intercept point (IP3) figures than those claimed by AOR. The internet article also said that AOR's test method was non-standard, with a result of spurious "good" numbers due to AGC action reducing receiver gain. John Thorpe later countered with a letter on AOR's internet WWW homepage and rec.radio.shortwave that disputed the claims, saying the method is indeed standard and that the test equipment used for Media Network's review was not sufficient for proper measurement. Both parties have posted detailed information on their specific methods and equipment to support their position. It should be noted that the Media Network review concluded that the receiver is a good value in Europe with "well above average performance in its price category". Other reviewers and independent tests have produced figures comparable to AOR's specifications, including Chris Lorek writing in Ham Radio Today and Craig Siegenthaler of Kiwa Electronics. User-reviews in the Danish SW Club International Shortwave News bulletin and on Ray Woodward's internet WWW homepage also give the receiver high marks. This is a feature-laden set even though the receiver has a sparse front panel. The full details are available on AOR's internet home page and the main points have been covered in other recent reviews. From a DXer's perspective, a number of these are worth commenting on. This receiver is apparently designed around the concepts of total control and information feedback. The menu system and dot-matrix display (discussed below) are critical to the AR7030's approach. A few examples are: passband shift settings displayed in 0.1 kHz increments; bass & treble adjustments shown in plus or minus decibels from a "flat" passband; dual audio outputs independently adjustable in audio level and displayed as a percentage of total output; volume and I.F. gain displayed as a percentage of total output; and the 100 memories which can contain the tuned frequency, mode, I.F. bandwidth, passband shift setting, scan include/exclude, squelch setting, and BFO setting for CW & DATA modes. The AR7030 is an expandable and flexible receiver. Options and accessories can be properly integrated into the radio's control structure, rather than "tacked on" as an afterthought. The AR7030's operating system can also be customized for specific commercial or scientific applications, according to AOR. A clear, backlit dot-matrix LCD display shows all receiver settings. Excellent use is made of a two-line display due to a carefully thought-out series of branching menus. The feel of DXing with the AR7030 reminds me of operating a laptop computer, such is the effect of the menus, the display, and the multi-function knobs and buttons. If it were not for this computer-like approach, the receiver would need numerous individual controls and a larger case. The receiver's price would also be higher! Three definable "setups" allow the user to quickly jump between favorite parameters for the type of listening desired. AGC, filter bandwidth, mode, tone controls, RF gain, etc. can all be assigned to the setup memories. I have setup "A" configured for general SWLing, "B" for tropical band DXing, and "C" for foreign MW DXing. Frankly, the menu system and flexible controls of the AR7030 may disenchant some radio hobbyists. Traditional design implies a single control for a single function, and a display or front panel that always shows the same information in the same spot! John Thorpe has given us a new approach. Using just a modest LCD display, the AR7030 can report virtually all receiver settings and intelligently assign "soft labels" to push buttons and rotary controls. The only controls with single, dedicated functions are the frequently used ones: the power switch, menu button, volume control, up/down mode buttons, the fast tune button and the main tuning knob. Those who are comfortable with computer software will quickly grasp the logic behind the AR7030's array of menus. Efficient operation with the front panel controls only comes with experience and understanding of the menu structure; the key is learning which menus keep your favorite parameters accessible. I prefer the filter menu with the assignable rotary knob soft-labeled as "PBS" (passband shift). This gives me immediate, direct access to filters, passband shift, mode, main tuning, volume, power on/off, and fast tune. A further press or two of the filter button allows adjustment of AGC settings (fast, medium, slow, plus off) and tone. Other receiver functions are accessed through other menu selections, or directly with the remote controller. Again, to some users this may seem to be an ergonomic nightmare. The AR7030 should be given a fair chance, however, as familiarity comes with practice. Fortunately the buttons have a good tactile feel to them, making quick changes easy. Those who cannot bear to operate anything that doesn't feel like the large, classic rigs of yesteryear will view the AR7030 as mere gadgetry. In my opinion it is not an unusual or difficult receiver to use, but rather fun to control after the initial learning curve. This is one of the unusual features of the AR7030, a capability it shares with the professional Racal RA-6790GM receiver. Many styles of MuRata ceramic filters (CFJ, CFK, CFW styles and others) plus Collins low-profile mechanical filters can be directly fitted. Other possibilities exist with Kiwa Electronics' Premium filter modules. The AR7030 will measure the bandwidth, determine the proper USB/LSB offset for each filter, and sort the filters in ascending order. The sequence takes about 45 seconds and is interesting to watch. The resulting exact alignment is useful during ECSS tuning of an AM signal, as there is no change in audio pitch when alternating between USB and LSB (if the receiver is properly tuned beforehand). The AR7030 is the first receiver I've owned which does not exhibit at least a small amount of USB/LSB error due to normal variations in the manufacture of individual filters and receiver alignment. The supplied bandwidths are nominally 2.2, 4.5, 7.0 and 10.0. Although four filters are standard with two optional filter positions, in reality any filter may be changed except the 10.0 kHz bandwidth (meant for narrowband FM). Any filter may be used in any mode. In my AR7030, these bandwidths are measured and displayed as: 2.0, 5.4, 6.5, and 9.5 kHz. The owners manual explains that most filters are named by their minimum passband and (if stated) their maximum stopband specifications. There can be variations from filter to filter, and even temperature of the filter affects the bandwidth. I've noticed a 0.1-0.2 kHz reduction in measured bandwidth of the filters in my AR7030 if I run the filter calibration routine after the receiver is completely warmed up (1/2 hour). Kiwa Electronics' new "Premium Filter Modules" make an excellent addition to the AR7030's arsenal of filters. Hookup is simple, using miniature coax cable for input/output leads. All module circuitry is inside a fully shielded enclosure. A ground connection and 4.5 to 15 volts DC power (at 1 ma) is also required. These modules have ultimate rejection better than 100db; my particular 3.5 kHz (nom.) filter module measures 107db. This surpasses even the highly-regarded Collins mechanical filters. The shape factor is stated to be better than 1 to 1.8, typically 1 to 1.5 or 1.6. The modules are available in selected bandwidths in the approximate range of 2.5/2.7 to 8.0 kHz, and the price is $70 US. A late addition to Kiwa's PFM series is a printed circuit board that holds up to three filter modules. I also have Kiwa's "High Performance Ceramic Filter", the CLF-D2K, made especially for Kiwa Electronics by MuRata. It is nominally a 3.5 kHz filter but displays as 2.9. The total of six bandwidths in my AR7030 measure and display as: 2.0, 2.9, 3.4, 5.4, 6.5, and 9.5 kHz. The difference between the 2.9 and 3.4 Kiwa filters is great enough in practice to make each one a worthwhile addition to the AR7030. This mode has the tenacity of a mountain goat and clings to signals weak and strong without problems. It is the best I've ever encountered, period. The passband shift can be adjusted liberally in synchronous AM (SNC) mode without causing squeals of complaint or loss of lock. Finally, a synchronous detector that a DXer can use! My ears cannot detect any rise in distortion in SNC mode (as reported in the Radio Netherland's review); in fact, audio sounds definitely better than with the AM envelope detector. With passband shift carefully adjusted, both Kiwa filters are very useful using this mode. As with the Drake R8 and R8A, the use of passband shift with the SNC mode allows selection of either sideband (or any point in between). This is an extremely useful tool for avoiding adjacent-channel intererence and/or peaking certain audio frequencies to aid intelligibility. The synchronous detector can be configured to use either a narrow, wide, or auto method of operation. Wide and narrow are "manual" settings; the user tunes the receiver until the receiver locks onto the carrier. Wide is easier to tune but cannot cope with selective fading as well as narrow can. The auto-synchronous method is an unusual feature that tunes the receiver automatically, locks onto the carrier, and displays the center frequency (normally with 30 Hz or better display accuracy). The AR7030 only needs to be tuned somewhere within the passband of the signal before switching to SNC mode. It's interesting to watch the receiver "think" a moment, tune up or down to the carrier, and then lock onto the station. My test signal for synchronous detection with any receiver is Radio New Zealand International on 15115 kHz during my local evenings. It's often subject to annoying rapid fades after sunset. My Drake R8 would lose lock and "bend" musical tones unmercifully, but there's no such problem when using the AR7030. I have not heard it lose lock even once on this signal. With the manually-tuned SNC methods, greater than ( >>> ) or less than ( <<< ) characters are displayed, indicating which direction the receiver needs to be tuned in order to gain lock. For unknown reasons, the auto-tune synchronous detector occasionally takes considerably longer than usual to lock onto a signal. The audio is heard uninterrupted in normal AM (envelope detection) while the receiver is "thinking". I've waited as long as 20 seconds for the AR7030 to switch to SNC mode. When it does, however, the result is rock-solid reception. The all-metal front panel and case are excellently finished and extremely robust. Only the built-in speaker's grill is less sturdy than I'd like to see. The front panel is at least 5/16" thick, and the large main tuning knob is solid anodized metal and comfortable for bandscanning (it has very effective and "seamless" variable-rate tuning, also). The two smaller rotary controls are not as comfortable, being rather tiny knobs attached to mechanical encoders with quite "stiff" click-stops. It helped to refasten the knobs a bit further out on their 1/4" diameter shafts. Aesthetics are mostly a personal matter, but in my opinion the AR7030 is quite good looking. The overall appearance resembles current British audio equipment. It does not have that "military-industrial" look common to many shortwave receivers. The AR7030's compact size and bunker-like construction will be appreciated by anyone taking it along for DXpeditions. At approximately 9-1/2" X 9-1/2", the receiver's "footprint" is very modest for situations where space is at a premium. The top-quality fit and finish is rarely seen these days in receivers in the AR7030's price range. This is a standard item supplied with the AR7030, not an extra cost option as with ICOM's R71A and Lowe's HF-250 receivers. Most major settings and adjustments can be done with the remote, although changing the AGC time constants and turning the receiver on or off is not possible. These must be done from the AR7030 front panel. The remote control has the "intelligence" we've come to expect from today's microprocessor-based receivers. Frequencies can be entered in kilohertz or megahertz. No leading zeroes or excess keystrokes are needed. Simply tap in the frequency, press the "kHz" or "MHz" key, and you're there. Frequencies can be entered from the keypad in increments as small as 1.4 Hz (handy for utility monitors). Tuning frequency step size can also be entered and tuned from the remote. The remote control is handicapped with small rubbery rectangles masquerading as pushbuttons (common practice on many remotes). Initially I did not care for the feel or size of this unit, but I've now warmed up to it. Rather than use the remote from across the room, I place it on the desk in front of my receiver shelf. I had a small "angle bracket" machined from black plastic and attached it to the back of the remote with heavy-duty Velcro fasteners. Two hidden lead strips (for extra weight) and small rubber feet (non-skid) complete the modification. This angles the remote towards the receiver and keeps it in a comfortable position. In this fashion I can change frequencies, filters, memories, passband shift, etc. with the remote at my left hand, while leaving my right hand free to control the AR7030 normally at the front panel. While actively DXing I tend to use the remote controller half of the time, and it's very handy to have its keypad available. The bracket is not needed if the receiver sits directly on the desk, as the infrared sensor has sufficient field-of-view. There is even a second infrared "eye" on the back panel of the radio to help catch reflected beams. All told, the remote is a fine addition to the AR7030 and adds to the radio's versatility. Larry Magne, in his Media Roundup review on Radio Japan and writing in Monitoring Times, spoke of a review model AR7030 that did not always register the remote's keystrokes. This is not a problem with my receiver; 100% of the keystrokes "take" if the remote is aimed anywhere in the general vicinity of the sensor. During the dawn-enhancement period of a recent DXpedition, I again encountered that heady experience of trans-Pacific MW stations appearing up and down the band with audio or strong hets. In a situation like this, the AR7030's infrared remote is essential for efficient DXing. A quickly changing DX opening is not the time to use a cumbersome receiver! Casual DXing can be done from the AR7030's front panel alone, but be forewarned that the remote is truly a necessity when you need to fly up and down the band (keypad frequency or memory entry) in the heat of battle. The receiver does have a Fast Tune button on the front panel, and it works well. Note: -156 dBc/Hz is the limit of the measurement system. 2nd Order Intercept measured at 4 MHz: +67 dBm. Note discrepancy between 23 and 4 MHz with IP2. 50 kHz spacing: +10.8 dBm 20 kHz spacing: +10.8 dBm. Note discrepancy between the IP3 at 12 and 2 MHz. As shown above, Kiwa Electronics performed their IP3 tests at 12 MHz which resulted in measurements very close to AOR's specifications. However, IP3 performance was reduced at 2 MHz. After much investigation, John Thorpe has determined that surface-mount components for the 1.7 MHz input filter do not have sufficient intermodulation performance to ensure high levels of IP3 around this frequency. A modification exists to retrofit leaded components (a few capacitors and inductors) in place of the surface-mount devices. The resulting IP3 is a flat response from 500 kHz to 30 MHz. AOR has not yet indicated if this change will take place on future AR7030 units. I have made this modification to my own AR7030 (see comments below), and Kiwa Electronics will retest its IP3 performance. In early May I took delivery of my AR7030 via FedEx from the communications retailer Javiation in the UK. The 695 UK pounds price to the States (including shipping) worked out to $1052 US. The $54 invoice for the customs duty put the total at $1106, which is just a few dollars more than a Drake R8A in the USA. If one doesn't mind the risks involved with overseas purchases this is the way to go, as the cost from US outlets reportedly will be around $1300. In the few months I've owned this receiver I have used it at home in a suburban neighborhood setting and during two DXpeditions to the Washington State coast. The home location is a test of the AR7030's intermodulation performance when hooked up to one antenna in particular: a 350 ft. terminated, impedance-matched mini-Beverage. Although this antenna is on a 270-degree bearing toward Papua New Guinea and Irian Jaya (two favorite DX targets), it is also directly in line with a few mediumwave powerhouses. The only instance of intermod I've discovered with this antenna and the AR7030 is weak garbled audio on 3260 kHz, which is the mixing result of my two most powerful locals: (2 X 850 kHz) + 1560 kHz = 3260 kHz. Both of these completely "pin" the AR7030's digital S-meter (maximum display of S9+50db) on their primary frequencies. With Drake R-7 and R8 receivers I previously owned, these two stations would show a level of S9+60db. The 3260 mixing product doesn't raise the S-meter above the S-1 level band noise, but it is heard with audio from both 850 and 1560. Switching in 10db of attenuation, adding a high-pass filter, or changing to another antenna completely removes the intermodulation. The intermod is only noticed when both stations are using daytime power. Both the Drake R-7 and R8 exhibited the same problem on 3260, so the AR7030 is not alone. So far I have discovered no other obvious mixing products--on any band--with the AR7030 at my home location. When I owned the R8 it had a few other problem frequencies between 2.0 and 3.5 MHz, and in the longwave region. With the AR7030 connected to lengthy, unterminated Beverage antennas at the coast, I find no indications of mixing products or other spurious signals on longwave, mediumwave or shortwave. Since modifying the high-pass filter as described above, the intermodulation products on 3260 kHz are completely gone. This is now the first receiver I've used that can pass the "3260 test". The AR7030 is clearly the quietest solid-state receiver I've ever operated. In a comparison with a Japan Radio NRD-525 receiver, the difference is dramatic. The low noise level is a revelation; and when used in a quiet setting with a good antenna you get the impression there is nothing between the signal, the atmospheric noise level, and your ears. The AR7030 seems nearly "transparent" as it goes about its business. Audio quality in all voice modes and bandwidths is very pleasant, reminding me of the sound from John Thorpe's HF-series of receivers. A bonus for DXers is the very useful bass and treble settings. There are no "do-nothing" knobs on the AR7030! Careful adjustment of the bass and treble helps intelligibility of weak, muffled stations such as the tropical band Indonesians. During a DXpedition I made a comparison between the audio quality of a Drake R8 and the AR7030 on trans-Pacific mediumwave and tropical band stations (Solomon Islands 5020 kHz in particular). I used the same pair of headphones (Realistic PRO-25) and tried various bandwidths on each radio. The receivers sounded slightly--but distinctly--different. The R8's audio could be described as "clear and crisp" and the AR7030's as "smooth and mellow". Both receivers are easy on the ears and can be listened to comfortably for hours on end. Most importantly, each receiver provides good intelligibility of signals. The above average filtering and the AR7030's passband shift control are highly useful for DXing mediumwave "splits". As an example, while listening to T3K1 Kiribati on 846 kHz, it was possible to avoid interference from a strong semi-local on 850 kHz by tuning in LSB and using the wide-ranging (+/- 4.2 kHz) passband shift. In my opinion the AR7030 provided better reception than a NRD-535D on this station. Even though the NRD-535D has the unique variable bandwidth control (BWC), that filter degrades in shape factor as it is narrowed. Also, the passband shift does not have an adjustment range approaching the AR7030's (the NRD-535D has a passband shift range of +/- 1 kHz). Because of different bandwidths in the two receivers, it was tough to compare the selectivity of the AR7030 against the R8A. The specifications would appear to give the AR7030 the edge. In actual use on foreign mediumwave and tropical band DX they both performed very well. More comparisons need to be done, but it appeared to me that the AR7030's stock filtering is at least the equal of the R8A. The extra Kiwa Electronics' bandwidths give a modest audible edge to the AR7030 when using those two filters in my receiver. Unfortunately, the R8A's filtering cannot be changed or upgraded because the bandwidths are composed of many individual and carefully-matched parts on the circuit board. Despite the useful passband shift, occasionally some carriers or hets cannot be overcome (as with any radio); a notch filter would be welcome on the AR7030. An optional notch filter is expected to be available by August from AOR, and it may include a noise blanker feature. Now I'm using a Radio Shack DSP-40 digital audio filter strictly for its "auto-notch" capability. The DSP-40 works well for the purpose, and at a close-out price of less than US. $40, it was an inexpensive solution. I do not find the current lack of a noise blanker to be a problem with this receiver. Still, I will likely add the noise blanker to my AR7030 when it's available, just to make the receiver complete. I prefer to tackle noise problems with outboard accessories such as the JPS ANC-4 Antenna Noise Canceller. With this approach the noise cannot affect the AGC of the AR7030, but the gain control of the ANC-4 should be used cautiously as its amplifier can be overloaded by strong local MW stations. 1) No immediate blast of audio in the AGC off position. The I.F. gain takes a couple seconds to reach 100%, so cycling through all three AGC speeds is gentler on the ears when the off position is reached. 2) The high-impedance antenna port and the ground connection for the AR7030 use a locking lever to engage the wire, rather than a spring-loaded pushbutton. I find it easier and quicker to use than the typical spring connector. A small detail to be sure, but it's appreciated when working around the back of the AR7030 in low light conditions or amongst a tangle of wires and cables. 3) The relay timer, the 24-hour clock, and sleep timer are easy to set and activate. I particularly like how the AR7030 displays both the current time and "TIMER ON AT 18:30" (for example) on the dot-matrix display when the receiver is on standby for remote recording. When the AR7030 is turned on for operation it can show the current 24-hour time, including seconds, on the display if desired. 4) Utility and HF aero monitors will enjoy the powerful scanning and squelch facilities. The receiver provides adjustable hold, delay, and mute, among other features. The squelch level can be set independently for VFO's A and B, as well as for each of the 100 memories. Scanning on HF has some real limitations, but the AR7030's independent squelch settings makes the most of variable conditions from band to band. 5) The bar graph S-meter is composed of 70 segments and is very accurate. I suspect that each S-unit (and intermediate step) is programmed into the AR7030's microprocessor, so that the meter will not respond until the proper signal level is encountered. Traditional analog S-meters are rarely linear and exacting across their entire range. 6) The excellent owner's manual is one of the best around, among contemporary receivers. Curiously it lacks the British colloquialisms found in other UK equipment manuals. It almost reads as if it was written by a US author. Particularly interesting are the discussions about the filter calibration routine and the automatic-tuning synchronous detector. Full technical details and a block diagram are at the end of the manual, but no circuit diagram. AOR does not include computer control data in the owner's manual. The PC information is in a separate nine-page document. Because it's possible to accidentally scramble the data in the AR7030's microprocessor via computer, AOR is reluctant to widely publish programming information. This receiver is a major leap forward in PC control capability (even individual mixers and oscillators can be controlled by computer link). Careless programming can turn the AR7030 into an expensive and attractive paperweight! Interestingly, all commands to the receiver are byte structured in binary format, so it is not possible to control from a terminal. 7) The customer service and support of AOR has been nothing short of excellent. They are clearly eager to answer questions, give suggestions, and be of assistance to new and potential AR7030 owners. Richard Hillier is the contact in AOR's Marketing Dept. at the UK facility. He can be e-mailed at: info@aor.co.uk Mr. Hillier can also put you in touch with John Thorpe and/or pass along your message to him if needed. As with any receiver, this radio has some quirks and problems here and there. The few that have gotten my attention are described below. 1) The selection of different filter bandwidths or RF attenuation settings causes a brief "pop" to be heard from the speaker or headphones. 2) For those who plan to run the AR7030 from 12 volts instead of the recommended 15 volts, be aware of some anomalies caused by the reduced voltage. On a DXpedition I did some comparisons between 12.5vdc operation and 15vdc, and discovered some subtle but real effects: a decrease in opposite sideband rejection and an increase in digital switching noise at 12.5 volts power. Using the lower voltage, I found that when tuning in USB and approaching a signal from below, a low volume, rising pitch is heard for about 1.5-2 kHz above (past) the center frequency. This effect is reduced 75-100% with 15 volts DC power! I believe this crude test illustrates a degradation in opposite sideband rejection at 12.5 volts. It was interesting to note that a NRD-525 was much worse in opposite sideband rejection at its normal 12vdc power. At the 12.5 volts level, I found a slight to moderate increase in switching noises, pops, and low buzzes when pushing various buttons. These were all at very low audio levels, but noticeable with careful listening. These noises are virtually absent at 15 volts, except for the brief "pops" when filter or attenuation settings are changed (these are louder and occur irregardless of DC power). Note that these artifacts are only heard during the actual brief moment that the button makes contact when pressed. In the future I plan to run the AR7030 from 15 volts exclusively, for any serious DXing while at home or on DXpedition. I have modified one of my 12vdc DXpedition lead-acid batteries to include 3vdc cells in series/parallel connection to provide the optimum 15 volts. 3) DXpedition use of the AR7030 with Beverage antennas revealed that the preamplifier is needed when listening to extremely weak signals, at or above the noise level under truly quiet conditions. In sensitivity comparisons to a NRD-525 and Drake R-8, the AR7030 equaled the competition only when its preamplifier was activated. (The test signal was Radio Enga, 2410 kHz, during fade-in with audio at 0820 UTC.) Note that the preamp helped intelligibility only for the weakest of signals under quiet circumstances. The typical suburban DXing location has enough local noise and interference to mask truly faint stations, and use of the preamp just raises noise (while reducing 3rd order intercept point, the opposite of what's needed in or near cities). Stated another way, it is my impression that the preamp helps weak signals in a DXpedition environment but not at home where noise levels are higher. I have not noticed any circuit noise increase when using the AR7030's preamp. 4) A receiver of the AR7030's caliber should have more than 100 memories. Serious DXers (especially if they tune foreign mediumwave) can easily make use of 200 or more memory channels. With only 100 memories, an excellent opportunity has been missed to make the AR7030 the receiver of choice for the DXer with many targets across the LF/MW/HF spectrum. The AR7030 memory system is very powerful; it's a shame that only 100 are possible. The fact that passband shift setting is stored for each memory makes the AR7030 unique among receivers. If 200 or more channels were available, the foreign MW DXer could store LSB, USB, frequency, bandwidth, and passband shift for each split frequency--across the entire band--as appropriate to avoid domestic broadcasters. The exact foreign MW frequency could be stored to step through the memories searching for audio, or the memorized frequencies could be offset (in LSB/USB modes) by a few hundred Hertz to create a heterodyne when a carrier is detected. The receiver's memories can be programmed this way now, but the 100 memories only provide for 900-1000 kHz coverage of the mediumwave band. Stepping through mediumwave with the infrared remote can be done, but the benefits of the AR7030's memories--particularly the passband shift settings--are unavailable. An internal battery and fast charger for the receiver should be available by August, and a carrying case for portable use is also planned. Development is underway for a notch filter and noise blanker, although I'm not sure if these two features will be part of the same option or if they will be separate items. AOR is also planning to expand the range of available optional filters, including crystal filters mounted on a special circuit board. Another planned option is a "VHF Band 2" board with FM stereo capability, to take advantage of the AR7030's two-channel audio path. Eventually, "upgrade" microprocessors will be available, allowing specific capabilities such as "VCR-like" timers for day, week, and year; alpha-numeric labels for memory channels, and other enhanced features. AOR is also developing Windows-based PC control software for the AR7030, with customized modules for propagation prediction and other related items for the radio enthusiast. The AR7030 is a very good value and for the money it's a lot of receiver, especially if you live in the USA and purchase direct from England. How willing are you to sacrifice a larger front panel, separate controls and the traditional approach to receiver operation in exchange for high performance, portability, and reasonable cost? It's not easy for long-time DXers, who have strong opinions about "real" radios. Will this receiver become a DXer's workhorse or languish on retailers' shelves as a collectable curiosity? AOR management will readily know our consensus answer to this question when they study sales figures in the years ahead. Mark Veldhuis of The Netherlands runs an English language e-mail list devoted to discussion of the AR7030 and its accessories, troubleshooting, and operation. This is an excellent forum for keeping up on developments. To subscribe, send an e-mail message to veldhuis@dds.nl with the word "subscribe" (no quotes) in the subject line; leave the body of the message blank. In return you will receive a message that explains use of the mailing list and you will begin to receive AR7030-related messages as they are distributed. AOR will also offer Plus version retrofit upgrades for owners of existing AR7030 receivers; contact AOR UK for details. I've been in touch with many owners of the AR7030, and all of them seem pleased with most aspects of the receiver. It's excellent performance is undisputed; the 1997 World Radio TV Handbook's thorough review generally praises the AR7030. It is safe to say that the AOR AR7030 will be a wise choice for radio monitors for years to come.